Planning on Deleting Backup Data from iCloud? Read This Now! iCloud is one of the backup options offered by Apple itself. By having a backup on iCloud, you will keep your data safe. However, sometimes your iCloud storage may be full and you need to store more data. Also, you may have some private data on iCloud and you may want to protect your privacy. In both cases, the best solution is to delete iCloud backup. If for these reasons you are thinking of deleting backup data from iCloud, this article will show you how. 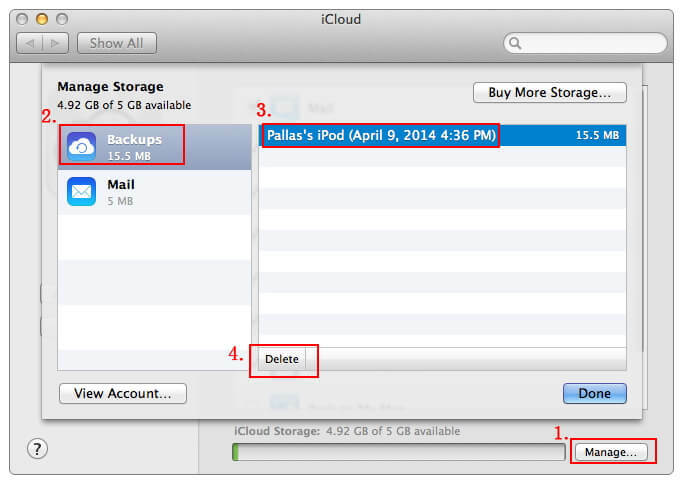 Part 3: Is It OK to Delete Backup from iCloud? Step 1: Open the Settings app and then tap Apple ID. Step 2: Tap iCloud and then Manage Storage. Step 3: Click Backup and then click the iPhone/iPad whose backup you want to delete. Step 4: Scroll down and tap Delete Backup at the bottom. Click Turn Off & Delete. Step 1: Click Apple Menu and then select System Preferences. Step 2: Tap iCloud and if prompted, use your Apple ID and password to sign in. Step 4: Tap Backups and then tap the backup you wish to delete. Step 5: Tap Delete and then tap Delete again on the confirmation box that appears. Finally, tap done. Repeat steps 4 and 5 to delete other backup files. Part 3. 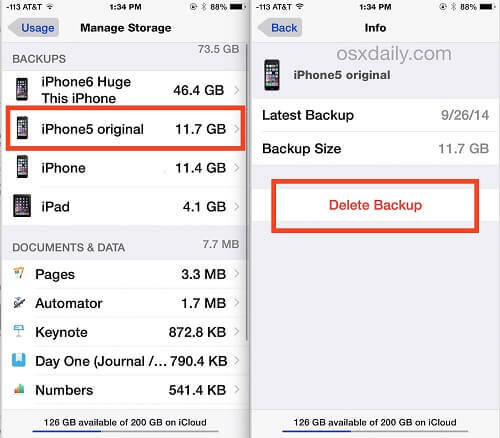 Is It OK to Delete Backup from iCloud? Deleting backup data from iCloud is OK. Even after deleting the data you have on iCloud, you will still have your data on your iPhone. However, it is important to note that if you only rely on iCloud to back up your data, you will lose the backup. Therefore, it is essential to make sure that you are deleting the backup for the right reasons. But, what are these reasons? Find out below. iCloud will offer you fixed storage space depending on the plan you select. If you end up using all the allocated space, you won’t have the ability to back up more files not unless you first free up some space. In such a case, deleting backup data from iCloud will be a valid choice. You may not be aware of privacy issues in iCloud backup, but privacy leaks are happening around you. Yes, iCloud storage may lead to a privacy leakage. The best way to keep this from happening is to delete the private data available on iCloud. After deleting backup data from iCloud, then just store the data on you iPhone, and delete them completely when you don’t need them anymore. However, if you use the conventional way to erase the data, it can be recovered. To eliminate the possibility of this data getting recovered, you will need to use a third-party tool to erase the data. The best third-party tool you can use is known as iMyFone Umate Pro for Windows or iMyFone Umate Pro for Mac . 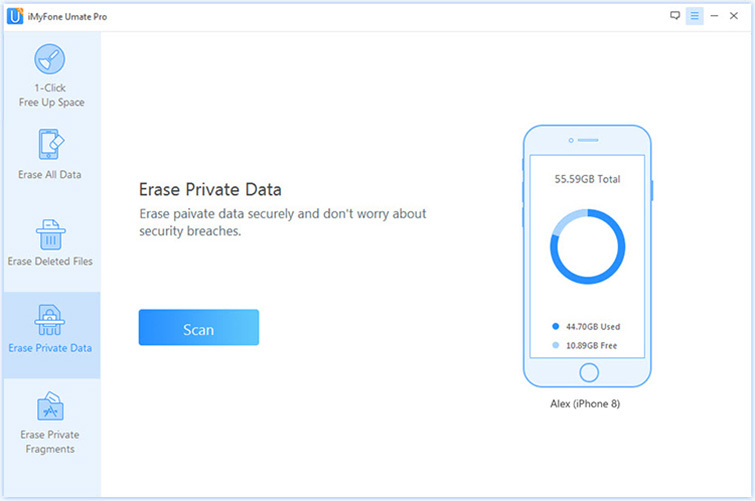 Erase your private data from iOS completely with 0% recovery even by the FBI. Erase your sensitive data include contacts, messages, call history, video, and photos, browsing data, and more. Wipe third-party apps completely. Examples of apps include WeChat, Kik, Viber, WhatsApp, and more. You will get to secure your private data when you are planning on recycling, selling, or even donating your iOS device. 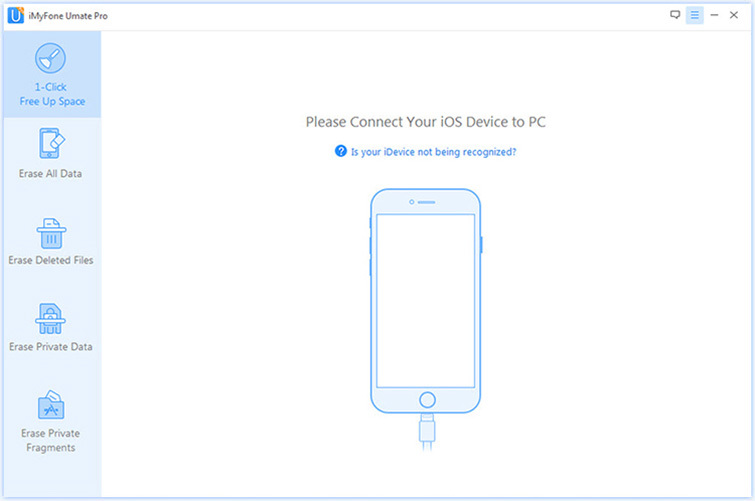 Step 1: Connect your iOS device to your computer and trust the computer if you are connecting the device to the computer for the first time. 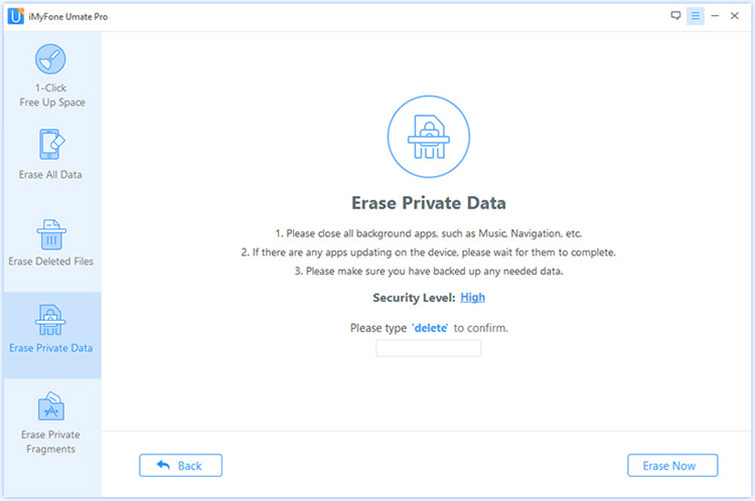 Step 2: Tap the Erase Private Data tab and then click Scan. iMyFone Umate Pro will start scanning your device. Step 3: Preview and select the private data you wish to delete. After selecting the data, click Erase Now button. Step 4: You can change the Security Level by clicking the link. To confirm you want to delete the data, you should type “delete” into the box. 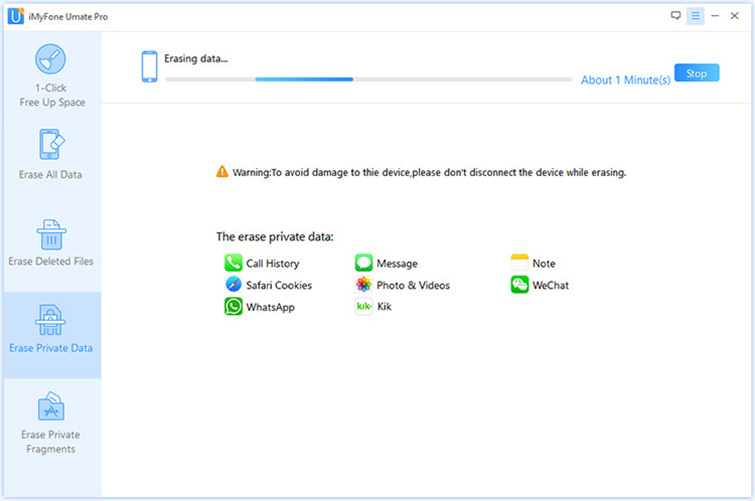 Step 5: After typing in “delete” into the box, click Erase Now to erase all your private data with 0% recovery. Deleting backup data from iCloud is recommended when it is necessary. Some of the situations which might require you to delete your iCloud data are when you have used all your storage space or when you want to safeguard your privacy. 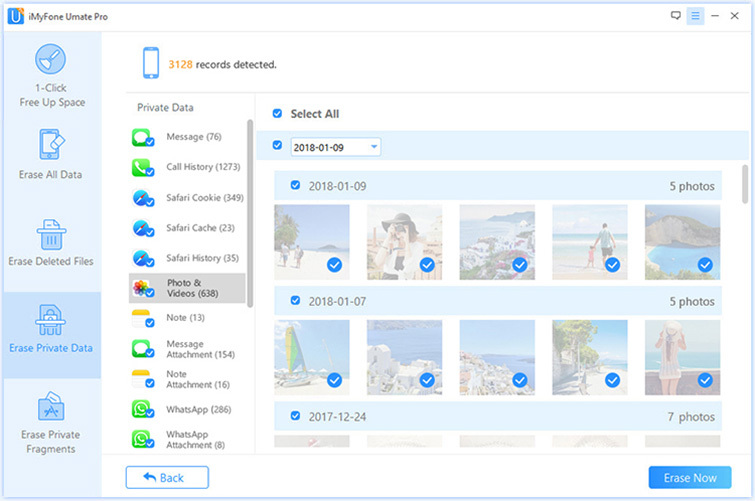 In case you are looking to safeguard your privacy, you need to delete your data using iMyFone Umate Pro. This will make sure that there is a 0% chance of the data ever getting recovered.